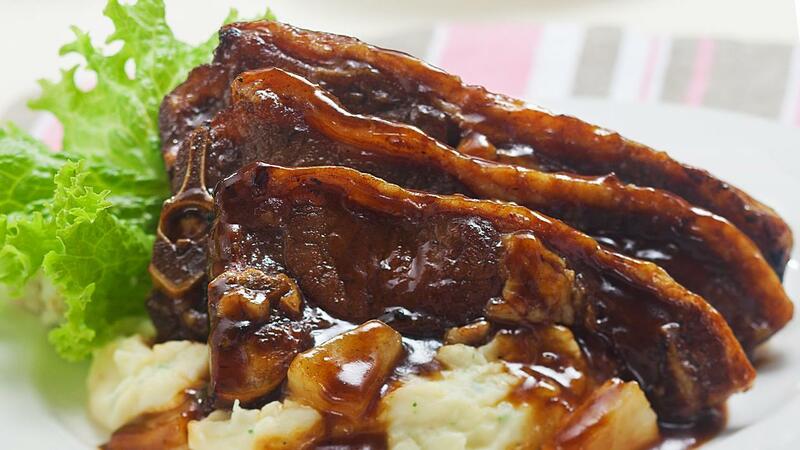 Marinated beef short ribs is the secret of this delicious dish. The sauce will be the perfect combination. Need long line queue, put this menu to gain more crowd! Mix all barbeque sauce ingredients except the beef ribs, stir well, cooks in low heat. Season the ribs with salt and pepper. Sear the ribs until golden brown on the outside, put into the sauce, add some water, and cook until the meat is tender and the sauce is thicken. Boil some water & milk then turn off the heat. Mix Knorr Mashed Potato and salt, stir well and set aside. Mix Best Foods Real Mayonnaise with other ingredients, stir well, set aside. Prepare serving plate, set the mashed potato, grilled ribs, lettuce & honey ginger mayo. Serve.